I’m painfully aware that many people don’t understand why we travel as much as we do. I get questions all the time about why we travel so much with the Things. Maybe its totally a matter of priorities. Maybe it is not worth it to those people. But the paybacks for us? Totally worth it. Here are 11 reasons to prioritise travel with your kids. First off I want to tell you that our holidays aren’t all sunshine and roses all of the time. When you ask me about how or why we travel with the Things I know where you are coming from. The idea of getting on a 16 hour flight and living out of a suitcase for 3 weeks doesn’t exactly thrill me either. Lugging 2 Things around tourist attractions in Rome seemed seriously overwhelming when we planned it. The idea of feeding 2 picky eaters our of our comfort zone of “normal” food makes me nervous. Hanging out with sick Things on holiday is no fun. What if they get sick? Or hurt? How do you navigate a foreign healthcare system and holiday insurance? All that expense to suffer all that stress. Is it really worth it? Now. If you are reading this right before your first holiday with one or more Things let me assure you. You will not find it relaxing in the same way that you did before you had Things. Having Things around does not make for a relaxing holiday. They still get hungry and tired and bored. They still wake up at the crack of dawn and will make you suffer with jetlag. If you have visions of sitting by a pool all day and reading a book while working on your tan then I hate to break it to you but you’re in for a rude awakening. A holiday with the kids gets you away from home. It gets you out of the day to day struggles of cooking and washing and ironing and paying bills. Away from school runs and work commutes. Away from after school activities and weekends full of birthday parties and other plans. A holiday gives you a complete break away from “real life” and gives you a chance you spend some quality time together. That break I was talking about? It allows you all to disconnect and reset. Emails and work calls may continue in the holidays but generally they are much reduced or eliminated. The washing and other housework are left behind. Without all these distractions we find it much easier to concentrate on being present in the moment and on having fun as a family. So you’ve left the flurry and distraction of everyday life behind and are concentrating on having fun as a family. You’ll quickly find that you are actually bonding! All these new experiences are brilliant ways to bring you all together. Even getting lost is an experience if you’re doing it together and your Things will learn as much from how you deal with adversity as they will from the extra 10 minutes in the car. My Things still talk about the tour we took together in Rome. They still remember having lunch in a volcano in Bali. Thing 1 even surprised me with a memory of a restaurant in Phuket which I would never have thought he would remember! Last time we travelled I had a bit of an out of body experience. I looked at my Things strolling onto aeroplanes and realised that they will never remember their first trips on a plane. 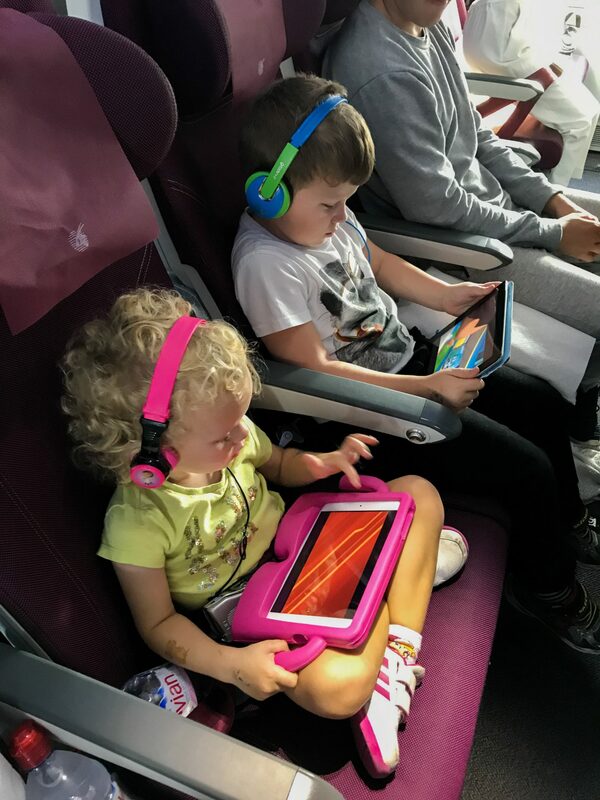 They are seasoned travellers now and they just know what to do. I, on the other hand, will remember that moment. I will remember their first flights. I will remember the first time I was able to watch an entire film on a plane. I will remember Thing 2 taking her first steps in the Maldives. I’ll remember taking Thing 1 on a transatlantic mission for a wedding when he was 9 weeks old. Wanderlust Family made a great point earlier this year when she said that parents’ memories are as important as the children’s. Speaking of memories, I think the experiences that we have with the Things and the memories that we make with them are far more valuable than any toy we could buy. I want to show them all the wonders of the world and I don’t just mean the 7. There are such incredible things to see and do in the world. I watch our little screen addicts (I have no idea where they get it from….) and the best way I can think of to get them up and doing things is to have awesome experiences with them. I’m not crafty mummy and I’m not brilliant at pretend play but I CAN do travel experiences! As the saying goes, different is better than better and I couldn’t agree more. Other people say that a change is as good as a rest. We always come back feeling so energised and refreshed after our trips away. As long as we approach it properly and prepare the Things in advance they go into a holiday with open eyes and open minds. On the one school holiday last year when we DIDN”T go away we were berated by Thing 1 for not arranging a trip! Did I say open hearts and open minds? The educational opportunities of travelling with Things are endless. From writing postcards to learning a new language. From map reading to learning about the history of the actual place you are in… English, maths, modern languages, social sciences, PE and RE are all easy to cover in a single trip. Again… It is hard to argue that Things learn and learn better in an interactive forum than from us just telling them stuff. Not everything will go right in your every day life and not everything will go to plan on holiday either. The simple act of coping in an environment that is completely different to what they are used to at home is a challenge for little Things. They might have additional things to cope with like different routines, skipped naps, jet lag and / or delayed meals. If your Things are anything like my sensitive little ones (I’m telling myself they are sensitive although they have funny way of showing it), then these could all be MAJOR things to handle. And that’s just the start of it. Watching how you deal with a flight delay or getting lost in the middle of the night. Maybe your bags got lost or the hotel has lost your booking. Watching how mummy and daddy deal with adversity can be a great lesson. (Unless you’re like me and potentially don’t handle such situations with elegance and grace). I’d like to think that by taking them out of their comfort zones, that we help the Things appreciate what they have at home. We talk to them often about how not everyone can travel like we do. We talk to them about the people not as fortunate as us in our every day life. To be honest though, the bubble we live in makes the whole concept of good fortune a rather abstract one. When we travel we are able to meet real people from other cultures. They can see for themselves the differences between their lives and other people’s. That is so much more powerful than anything I can tell them in words. This might be one of the last points on this post but, for me, this is one of the most important. I talked about it a bit in my post on Adult Third Culture Kids. I feel like we have brought our Things into a scary world where hatred and prejudice are all around us. The daily news brings us devastating stories of men being unable to live in harmony alongside their fellow men. Bringing our Things up in a homogenous environment can’t possibly help them understand and accept differences. We hope that by introducing different cultures into their lives at such early ages, we can help them understand and accept differences. Maybe they will even come to view differences as something be celebrated instead of something to be feared and resisted. I guess all of these things are lessons for the future in their own right. Don’t get me wrong, the primary reason why we travel with the Things is because we love travelling ourselves and will persevere to make it work for our whole family. BUT. That’s not to say we would continue to do it if we thought it was detrimental to our Things in any way.On the contrary, we believe that these lessons are life lessons. How to deal with adversity, outside of your confirm zone and routine? SO important in life. Celebrating and appreciating differences? Surely this will only stand them in good stead. Forming lasting bonds with the rest of the family? I’ll take it! The fact that we see such value in travel and that we place such importance on the lesson our Things are learning makes us want to travel more and more with them. Next Post 2017 – A Summary of an Absolutely Incredible Year of Holidays! We wouldn’t change travelling with our children for anything! Making memories and sharing special moments as a family trumps everything else. A wonderful post-Emma! Thank you so much! We wouldn’t change it for the world either! It’s not always easy but it is definitely always worth it! Ha ha I knew you would agree!